Connect your hose to any attachments in literally just a second! Will make changing out hose nozzles a breeze! 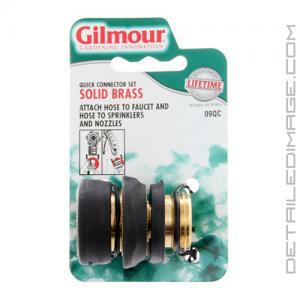 The Gilmour Brass Quick Connector Set will make changing out hose nozzles a breeze! Simply screw the male piece in your hose and the female piece in any hose attachment nozzle, then you can just snap and go! This saves you from endlessly twisting on and off hose attachments. Pair it with the Gilmour High Flow Dual Connector and you will be able to shut off the water and switch out a nozzle lightning quick! This Quick Connector Set is made of high quality solid brass so you know it will withstand a beating. It also has rubber grips which make for easy handling with wet hands. The rubber connectors also act as a bumper so you can safely place it on the ground and you won't accidentally hit your paint with the brass. Another great thing is that when you use these connectors it allows the hose nozzle to rotate freely in your hand so you can use the nozzle at any angle. No more twisting the hose or struggling with the nozzle! The Gilmour Brass Quick Connector Set will save you time and make switching between nozzles quick and easy! Pick up multiple sets for all around your home today! Excellent product, solid brass not just plated, the rubber grips protrude for ease of use with wet hands. One suggestion for those wanting to buy this. The release collar tends to get stuck frequently, but a quick dab of oil around it will have it working in smooth order. Definitely is a must have quick re/dis-connect tool for your hose(s), spray guns, etc.